One Sunday I made a game together with my son. 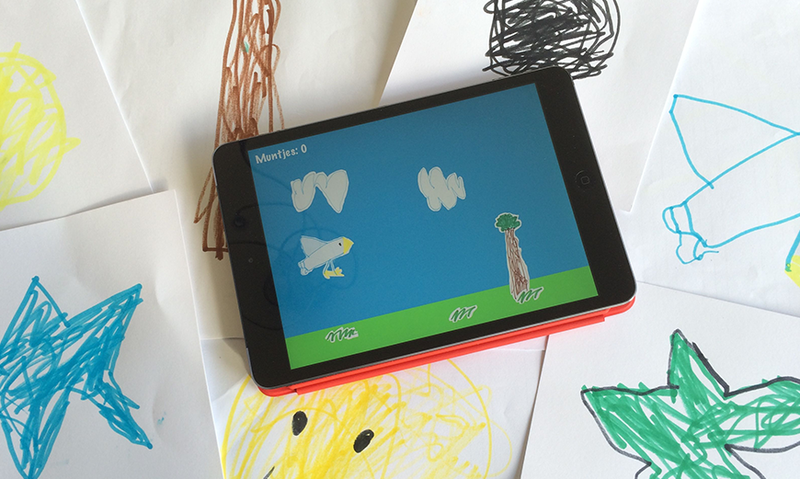 Robbe is 5 years old and he grew up watching his dad building games for kids. He was always very interested and happy to test my apps, and recently he discovered the wonderful world of Mario while playing Super Mario 3D World and Mario Cart on the Wii U.
I love the creativity of children, and I wanted to do something with it. I just came back from a inspiring CoderDojo where I helped a 12 year old boy recreate Flappy Bird. The next morning, Robbe drew lots of birds in different colours and explained what they all could do. He was never very enthusiastic about drawing, but recently he started creating all sorts of stuff. So I proposed the idea of making a game with his birds, and he was totally up for it. I put him to work to create more assets for the game, and made him responsible for the gameplay and design. A game with birds (not a Flappy Bird clone this time), bombs, stars and coins. The bird has to collect all the coins (mmm, where did he get that idea from). If you catch a coloured star the bird changes colour and morphs into another bird. If you fly against a bomb, the bird falls and it’s game over. That was the basic idea, and we worked that out during the Sunday afternoon. The time I spent building the game was not interesting to him, so I needed a tool which could produce something fast. 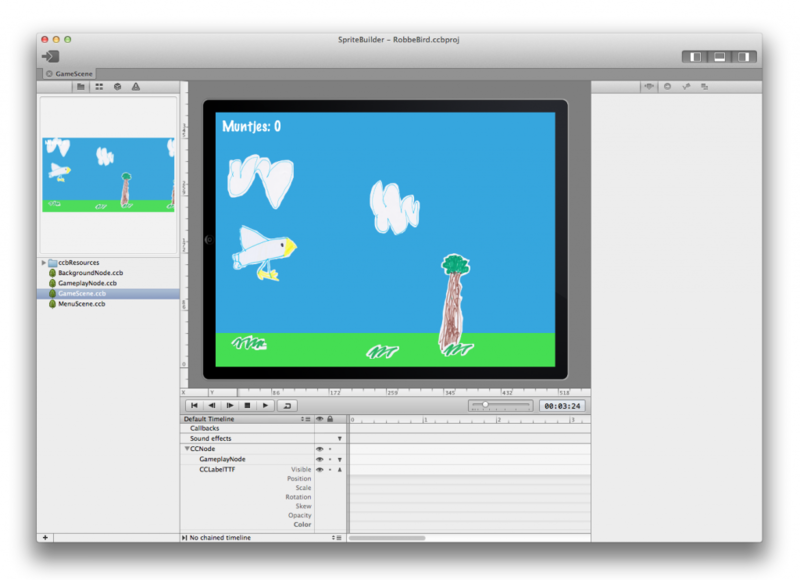 I used Cocos2D before and they just released V3 and SpriteBuilder which is an awesome game editor. So that seemed like a perfect match, and a good excuse to test it out. I scanned all the game assets and cut them out quickly using my superb Photoshop skills. Then I created a first level in SpriteBuilder. I used CocosBuilder before when building Wee Subs and Wee Rockets, but the tool has improved a lot since then. I had a working prototype in a couple of hours because I could drag and drop the sprites to the scene and I only needed to write a little but of code for game logic. Later that week I added the animations and effects. It’s really fun to create something with children, especially your own kids. They have great ideas that can make no sense, but are very original. We created something and I hope to do this again. Maybe one of our experiments will become a real game someday. Who knows, but the most important part is that you just keep on playing with technology and new stuff. I love Apple’s Sprite Kit 2D game engine, but having a tool like SpriteBuilder makes such a big difference. I thought Cocos2D was dead, but boy was I wrong. Very sweet! Hope to do this with my kids some day. Thanks! It was a fun experiment to do. Very inspiring, you should get on stage and talk about it.